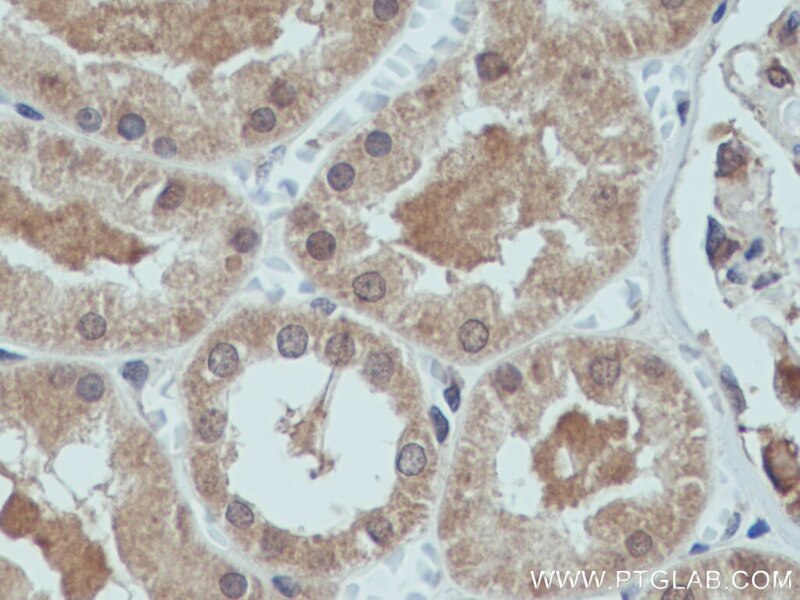 Immunohistochemical analysis of paraffin-embedded human kidney tissue slide using 18989-1-AP (GLI2-Specific antibody) at dilution of 1:200 (under 10x lens) heat mediated antigen retrieved with Tris-EDTA buffer(pH9). 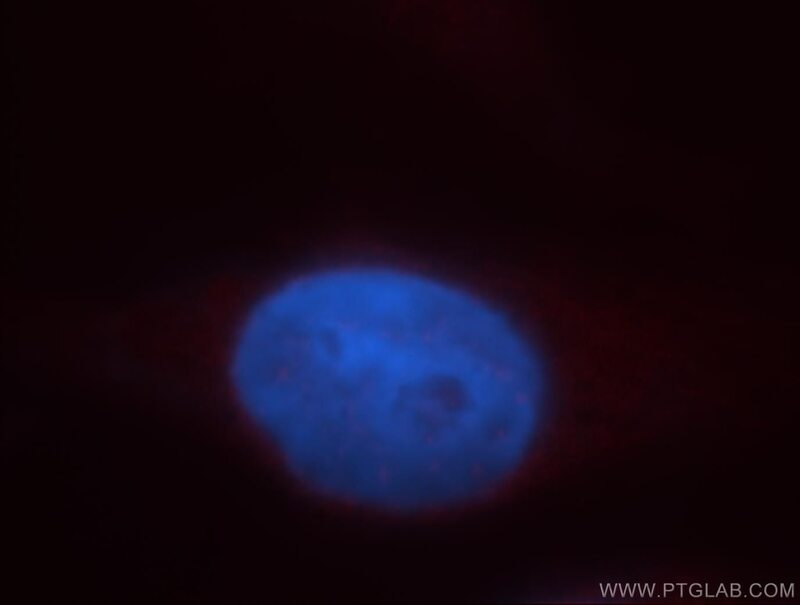 Immunofluorescent analysis of Hela cells, using Gli2 antibody 18989-1-AP at 1:25 dilution and Rhodamine-labeled goat anti-rabbit IgG (red). Blue pseudocolor = DAPI (fluorescent DNA dye). GLI2, also named as THP, belongs to the GLI C2H2-type zinc-finger protein family. GLI2 play a role during embryogenesis. It binds to the DNA sequence 5'-GAACCACCCA-3' which is part of the TRE-2S regulatory element that augments the Tax-dependent enhancer of human T-cell leukemia virus type 1. It is implicated in the transduction of SHH signal. Mutation of GLI2 will cause of holoprosencephaly type 9 (HPE9). Four possible isoforms (hGli2a, b, g, and d) are formed by combinations of two independent alternative splicings, and all the isoforms could bind to a DNA motif, TRE2S. hGli2 a, b, g, and d. These isoforms encode 133-, 131-, 88-, and 86-kDa proteins, respectively. Effects of baicalein on pancreatic cancer stem cells via modulation of sonic Hedgehog pathway. Disulfiram/copper targets stem cell-like ALDH+ population of multiple myeloma by inhibition of ALDH1A1 and Hedgehog pathway. Sulforaphane inhibits gastric cancer stem cells via suppressing sonic hedgehog pathway. Expression pattern of sonic hedgehog signaling and calcitonin gene-related peptide in the socket healing process after tooth extraction. Effect of Smo SiRNA-mediated Hedgehog Signaling Pathway Inhibition on Palatal Fusion. Primary Cilia Negatively Regulate Melanogenesis in Melanocytes and Pigmentation in a Human Skin Model. 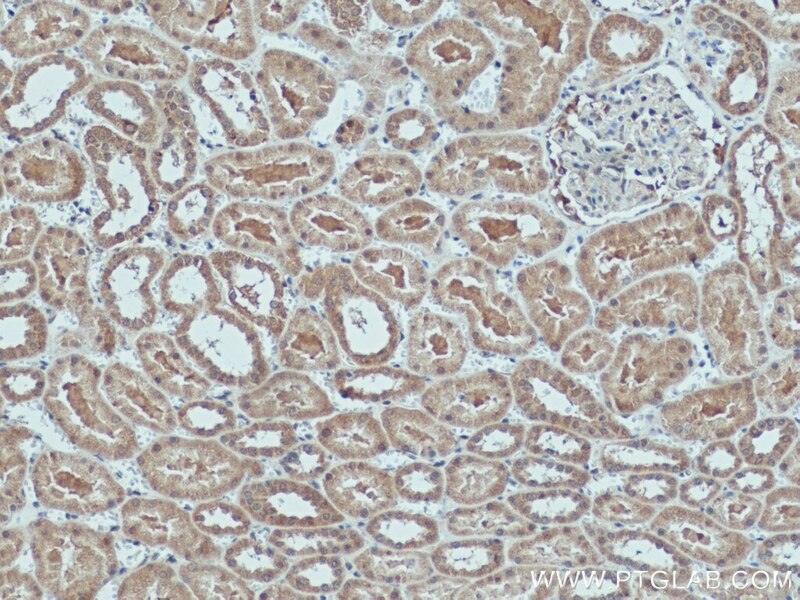 Immunohistochemical analysis of paraffin-embedded human kidney tissue slide using 18989-1-AP (GLI2-Specific antibody) at dilution of 1:200 (under 40x lens) heat mediated antigen retrieved with Tris-EDTA buffer(pH9). 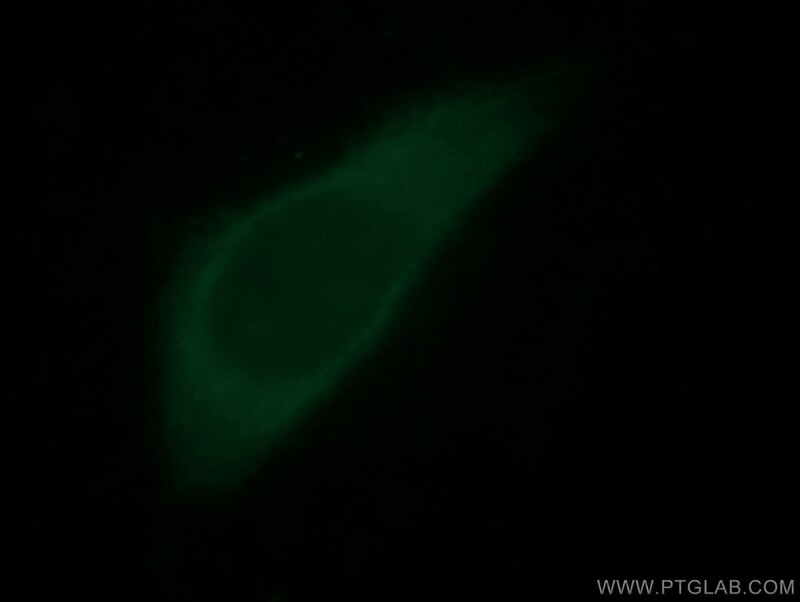 Immunofluorescent analysis of MCF-7 cells, using Gli2 antibody 18989-1-AP at 1:25 dilution and FITC- labeled FITC-Donkey anti-Rabbit IgG (green).